Summary: You can create your own adventure when conditions are right. 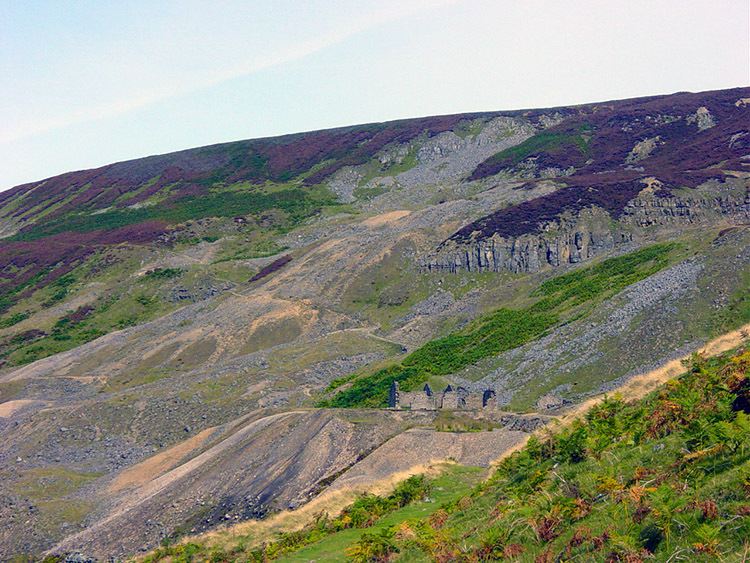 Apart from going up Gunnerside Gill and down Swinner Gill the walk visits lots of old lead mine workings. Some of the buildings on the sites are being renovated making the walk more interesting. Dave, Deke and I did this walk one Friday afternoon in mid September 2003. It was a beautiful sunny day and after stopping in the highly recommended cafe in Reeth for coffee and toasted tea-cakes we arrived in Gunnerside in good fettle and good heart. I had chosen this walk, Dave and Deke had no idea where we were going or what lie ahead but by the end of the day they were thoroughly pleased with my choice. We parked up in Gunnerside village, near the old town hall and set off in glorious sunshine following Gunnerside Beck up towards Gunnerside Moor. The walk up the beck side is delightful. 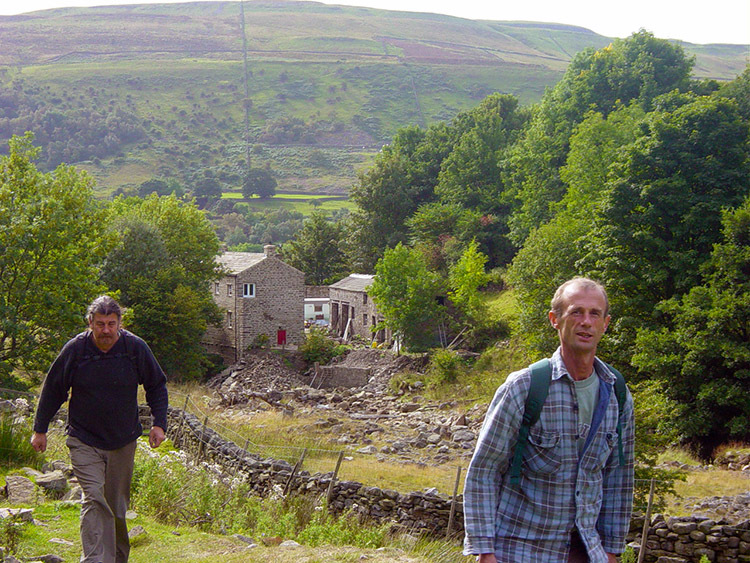 For the first mile you have the option to walk in the woodland at the side of the beck or in the fields to the right. Dave and I chose the woodland but halfway along Deke made a detour into the fields. Sunny fresh air was his choice, beautiful woodland walking, with the odd collapsed tree barrier was ours. 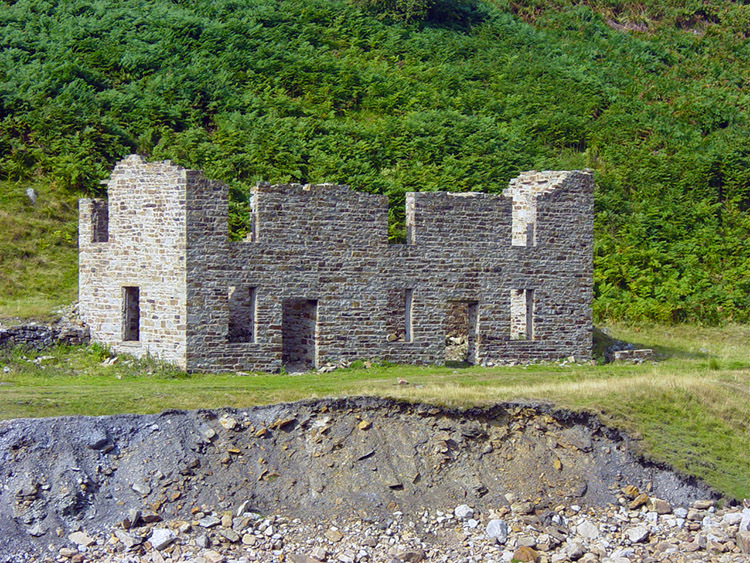 Soon though we were reunited just before mine workings at Middle Bank, part of the extensive Old Gang Mine Workings. 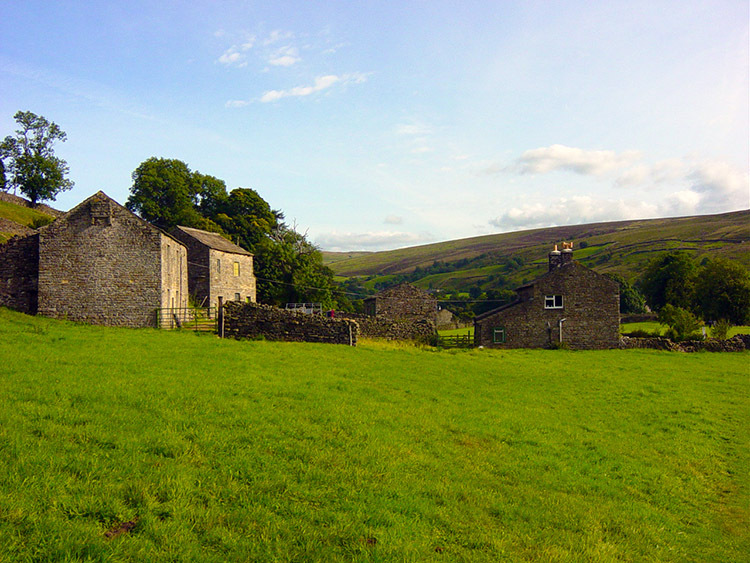 Gunnerside had a thriving lead industry in its heyday. After Middle Bank the path led us away from the waters edge and up to a path about 60 metres above the valley floor. 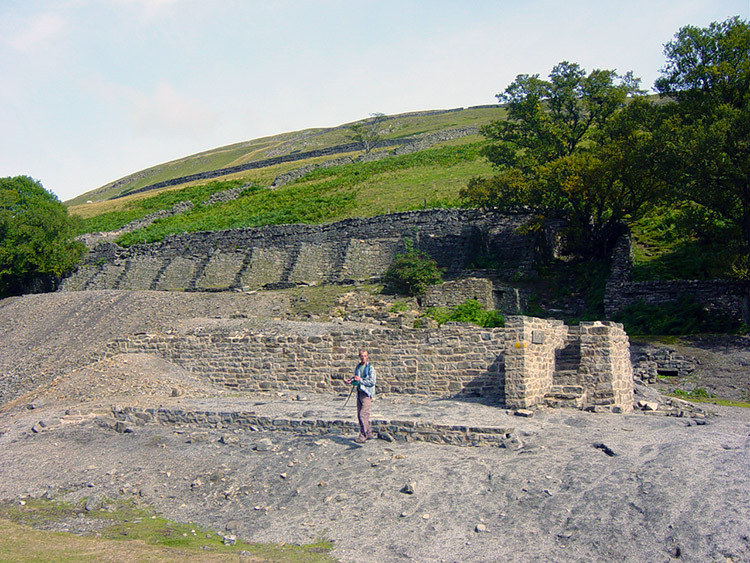 The views of the valley top were excellent and we could now see evidence of extensive work on both bank sides in the past. The next major mine workings we reached were around the area of Swina Bank Scar. The site of old workings at Swina Bank Scar is one of the largest I have seen in the area and both banks had extensive gouges worked out of them at Gorton Hush, Friarfold Hush and Bunton Hush. 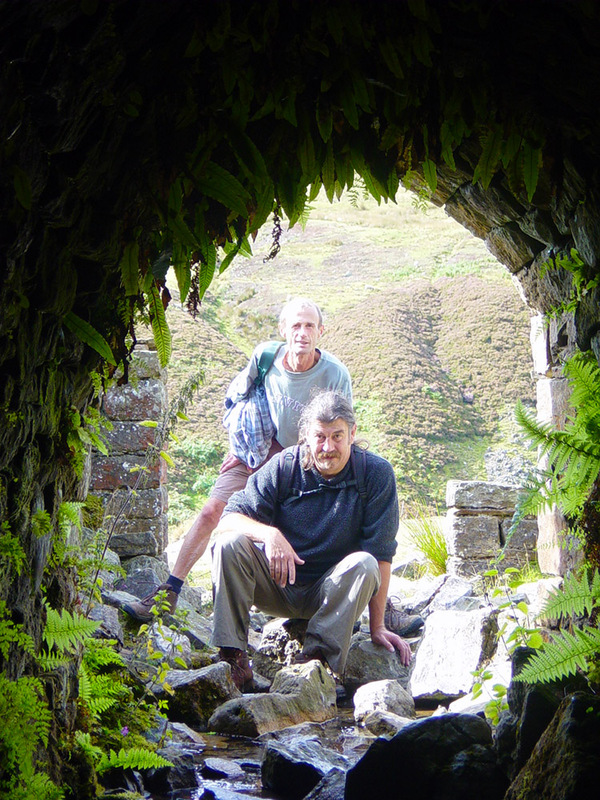 We stayed at the site for a while to explore the works, including the mine level you can see Deke and Dave peering into in the picture. It may have gone for some distance into the hillside but we ventured inside for just a few yards, staying safely in light. Going further would be reckless and not recommended. These levels are pitch dark inside with precarious unguarded shafts. Going into levels is definitely out! After our break we headed on up the beck to where it became a gill and crossed at the waterfall in the picture above to walk back down a short while before walking up the watercourse of Blind Gill. If the first part of the walk was standard fare on recognised footpaths, albeit up a marvellous valley then the walk from now on became more unpredictable. 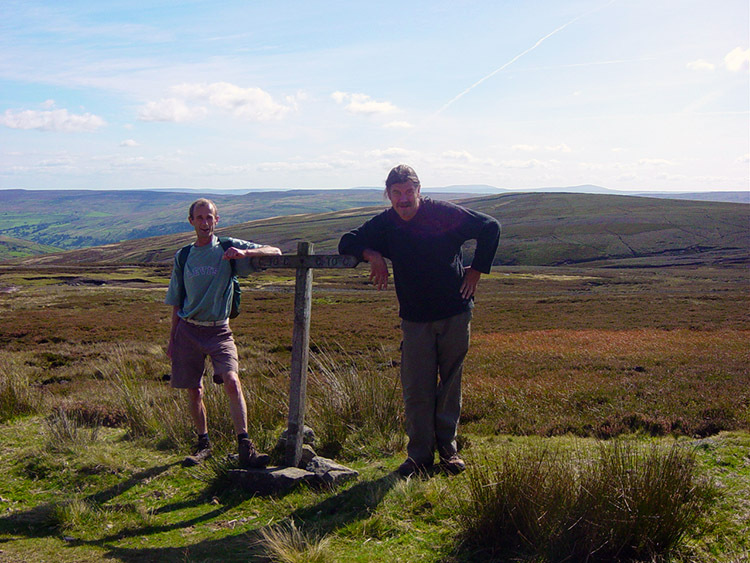 The original plan was to follow the moor crossing on the Coast to Coast path to Crackpot Hall near Keld and then over to Whitsundale and Angram before following the Swale back to Gunnerside. However, we had set off walking quite late and had decided on a drinking session in Harrogate in the evening, so an alternative was sought that would get us back to the car before 5.00pm. This is the story of the alternative! The map showed if we walked up Blind Gill for a few yards then a path would be taken on our left onto Lowhathwaite Mea. We thought, OK! I thought I had spotted the path so we followed it. The path turned out to be a sheep trail which took us straight back down to the gill. What a fortuitous small error. 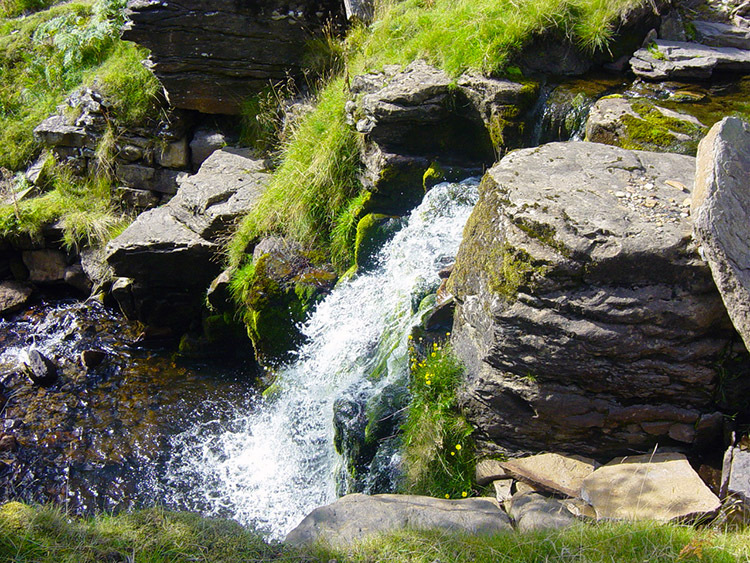 The walk up Blind Gill was brilliant and we all enjoyed clambering up the gill (see picture) to Blind Gill Head. At the head we emerged onto the moor and after a short walk over heather moor we regained the Coast to Coast path. We all enjoyed the detour, I'll do it again. A little time had been lost now though and the original route was shelved. 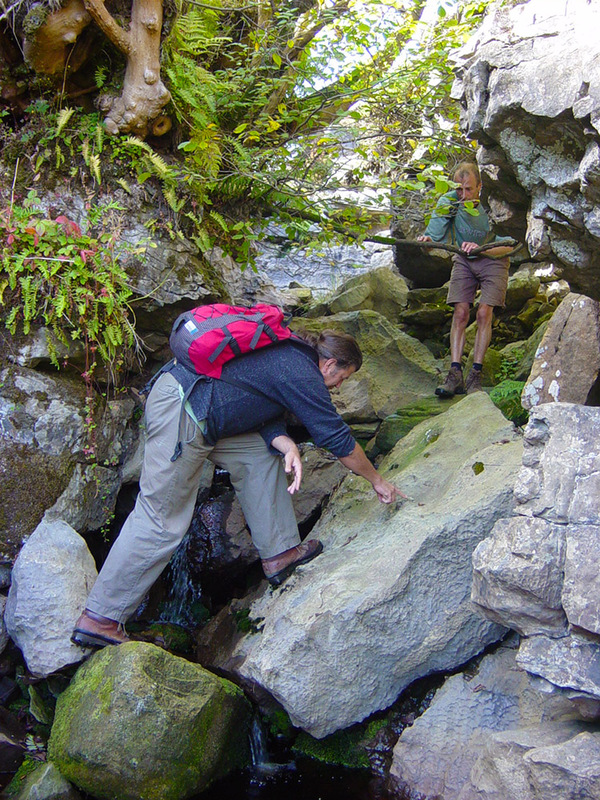 Deke had wanted to walk down Swinner Gill and this is what he and Dave did while I stayed on the western bank footpath taking scenic pictures. 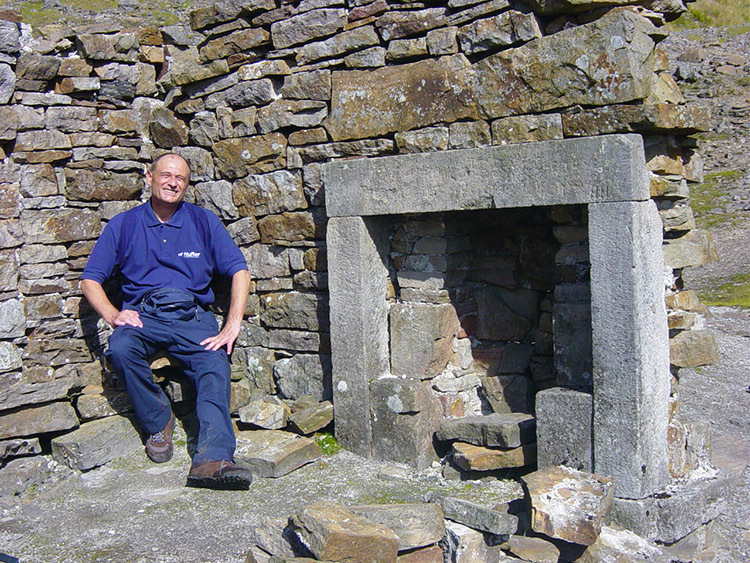 So after the crossing of the moor we arrived at the Swinner Gill Lead Mines and stopped for a late lunch. Once we had eaten the boys walked down into the gill to follow the waters edge while I stayed on he western bank just above them to take in the brilliant views. The boys loved their walk down Swinner Gill and talked about it being so exciting that I'll do it next time. 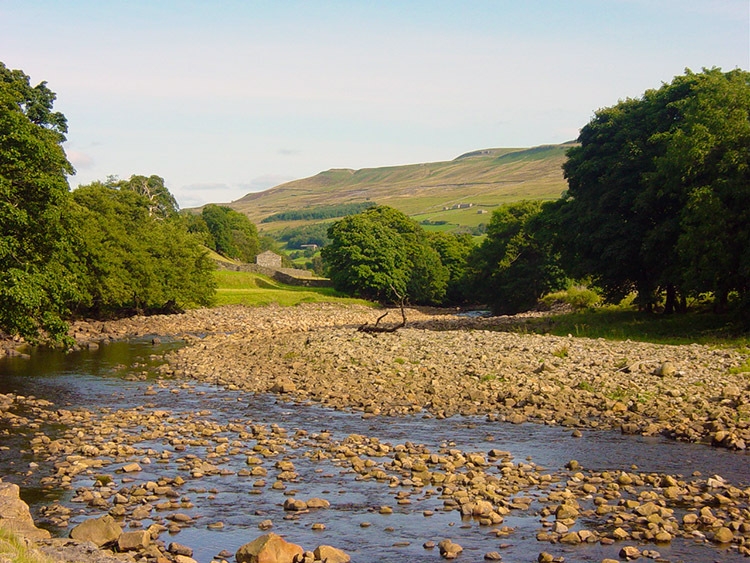 While listening to them raving about the delights of the gill I continued to make my way along the marked path to the head of the Gill where I met the River Swale. 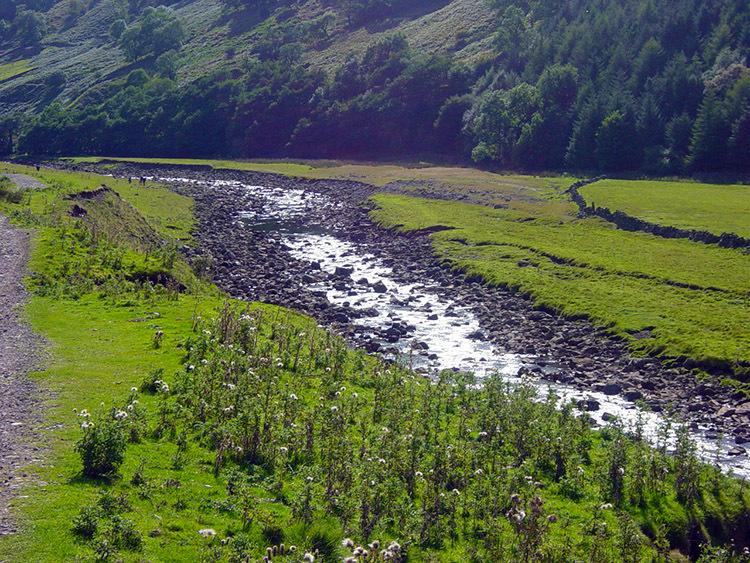 I then walked along the Swale following it downstream towards Muker before stopping on the riverbank and taking a break while I waited for the boys to catch up. After about 20 minutes I saw them about 500 yards away walking on the far bank of the river. I sat and watched them for 10 minutes as they approached and walked straight past me. They did not even see me and only when I shouted to them did they twig! It was so funny. 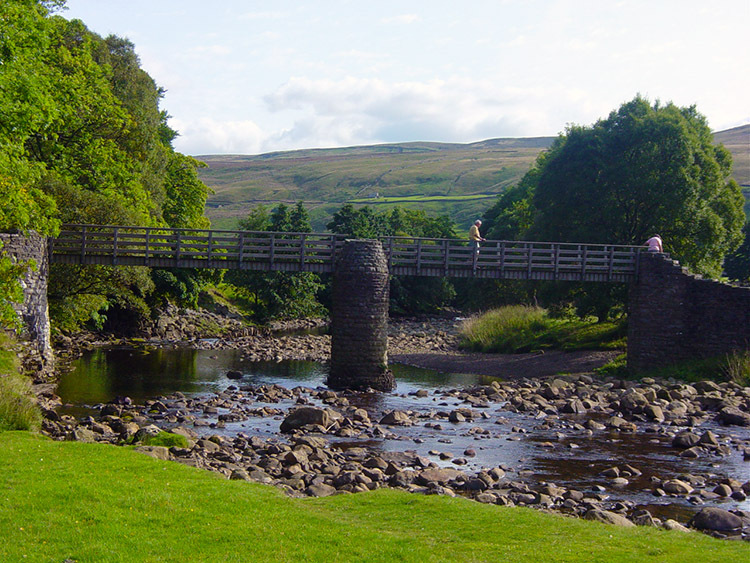 After walking side by side on opposite banks for half a mile we made our re-acquaintance at Ramps Holme Bridge, a wooden footbridge on the River Swale near to Thwaite and Muker. 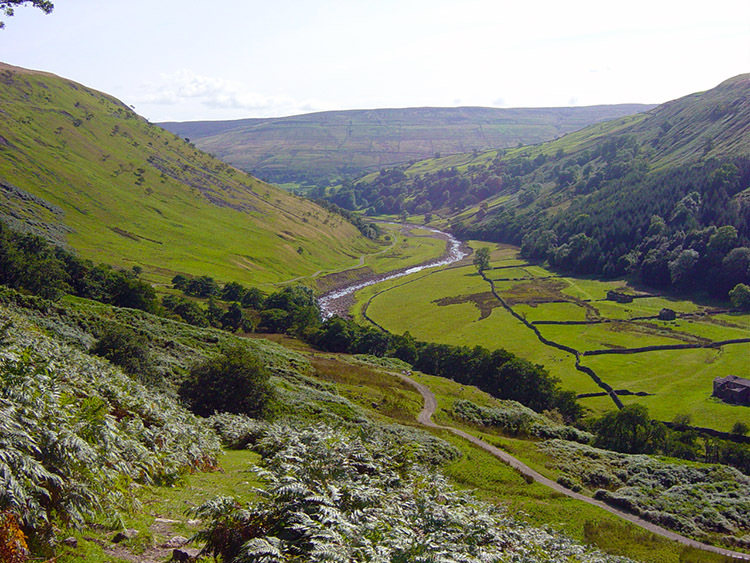 We then followed the river back to Gunnerside via Ivelet which concluded a fantastic walk in superb scenery on a superb day. We each had a bar of chocolate to cap off the walk. And later on we had a great night making it a memorable day all round.